Is it a slot? Is it an instant win? 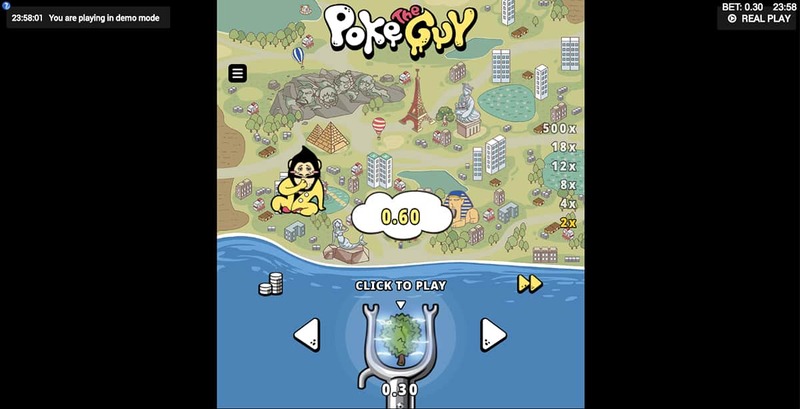 Well…it’s Poke the Guy Game. Which probably doesn’t even answer the question at all but to be honest that’s the mindset we’re constantly left in whenever we play this game. We’re not really sure what it is. Why are we poking this guy? Why does he wear an awful yellow tracksuit? And what on earth have Microgaming created? Lots of questions though do lead to lots of fun, and the chance to win 500 times our bet. 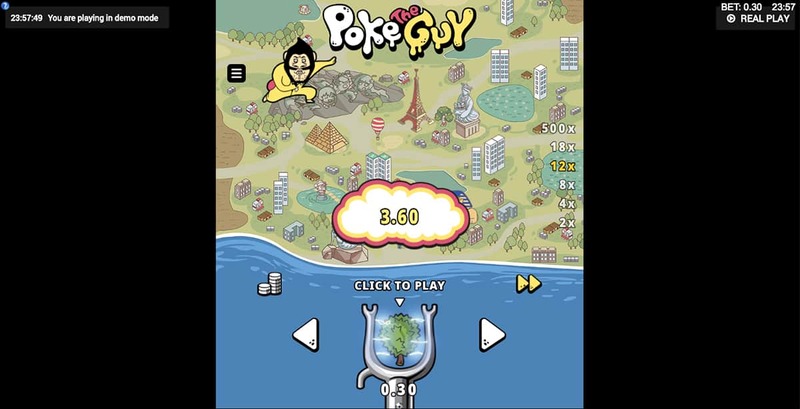 Poke the Guy looks and feels like a mobile game crossed with an instant win (and certainly plays like one). Most of the screen is taken up with a map filled with famous landmarks, such as the Eiffel Tower, the Sphinx and Mount Rushmore to name a few. Perhaps Microgaming’s developers need to re-do their geography exams. On the bottom of the screen we have an expanse of water with a weapon at the very bottom centre of the screen. This is where we rub our hands together as we select our weapons and get ready to give this guys a darn good poking. As for the ‘guy’. Imagine if Leisure Suit Larry (look it up if you’re too young for that reference) and Borat had a lovechild. A creepy looking dude in a yellow jumpsuit, chest hair protruding out and goatee and hair firmly pointing up. The guy moves around the screen, gyrating, dancing and generally taunting us. No wonder we want to poke him with a variety of weapons. 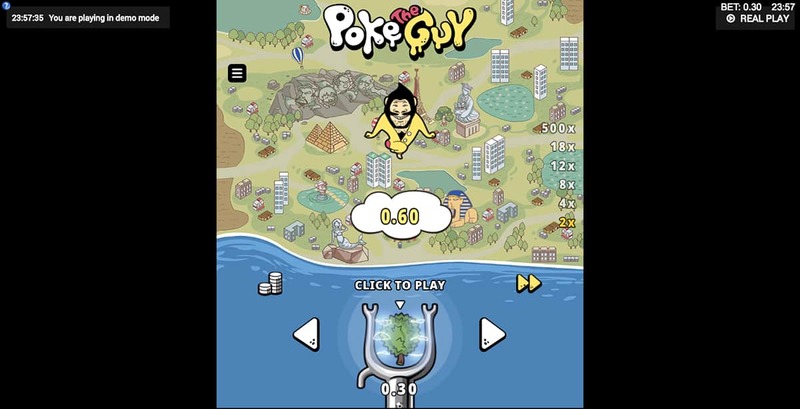 In Poke the Guy, we’re not just trying to poke him. We’re trying to decimate him. That’s why the weapons available range from Piranhas to Ice Creams to Knives. The more serious the weapon, the bigger the bet. We can make this selection by pressing the arrow keys left and right, with the option to bet from as little as £0.1 up to £30. We do that then we know the guy is definitely in for it. Once we’ve made our choice and fire our weapon, off it shoots and hopefully gets the guy. We are treated to a fun animation if we’re successful, for instance the top half of his body being removed! The downside is that there is no skill to this game as we can’t aim where we shoot and it’s completely random if we end up successful or not. There are also no bonuses as such but we can get random Multipliers which help us to win a nice payout of 500 times our bet. So it’s not all bad. It’s not really a slot (despite being billed as one) and it’s more of a casual game but Poke the Guy definitely should have a place in everybody’s gaming library. It’s a fun-filled affair which introduces us to a wacky character. And then essentially we get to kill him. As it’s available on mobile and tablet, it’s definitely more fun to play on the go, with the added extra that we can pick up a generous payout along the way.